In the mountains, we design your home to fit the lot you choose, not the other way around. Slope, access, drainage, the suns orientation, livability, and COST should all be considered during design. 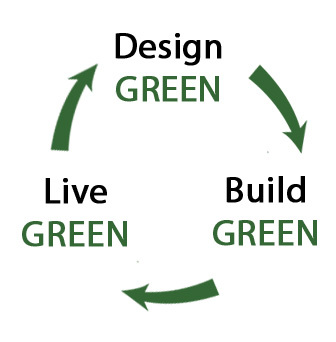 By designing green, we set your project up for success. It is important to take into consideration all the practices that will be used to ensure that you have a healthy, green home from the very beginning. Read below to see why there is so much more to your decision to build rather than just the “house” itself. Building The Living Stone Way will impact the way you live. It is through our People, our Process and our Product that we are improving the building practices that effect your future. The home building process reaches far beyond just “construction”. When you build a home with Living Stone, we will be taking into consideration ALL of the things that are important in your next transition. By bringing together these pieces of the puzzle–we create for you the perfect package and maximize your investment. 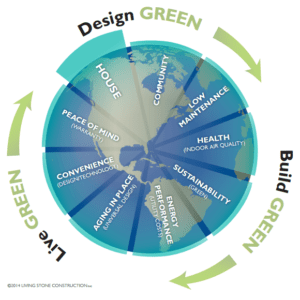 With the Living Stone team, you will be Designing Green and Building Green, but we will also work with you on how to live healthier (and longer), by Living Green.